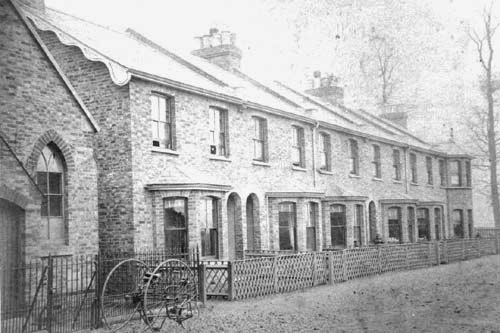 Primrose Villas, built 1885, with the Chapel in the left foreground. Primrose Villas were developed by John Moore in 1885; Moore's own house is the one at the far end of the row, beyond which is farmland. In front of the Chapel is a full-sized tricycle. This photograph was taken before any footpath was laid outside the houses.